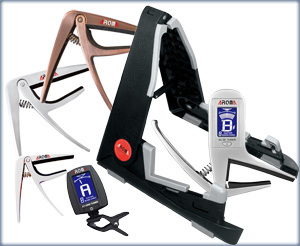 Aroma provides a great series of clip-on tuners and metronomes! Aroma provides a high quality product line of accessories for guitars and ukeleles.Guitar stands that fold into practically every gig bag, capos that sport a contact tuner besides, Aroma is always at the drawing board developing exciting accessories that make a musician’s life more fulfilling (or bearable, as the case may be). Sturdy housings, high grade plastics and dependable workmanship ensure years of hassle-free Aroma use! Proceed to check out the brandspanking NEW series of effects pedals for guitar and bass! !